This is one of my favorite go-to recipes. I marinate the fish and make the edamame/wasabi spread a day in advance and place into a glass, air-tight container to let the flavors mingle and get friendly with each other. This wonderfully fresh appetizer can be served over sesame crackers, fried wontons, cucumber slices or tucked into endive leaves. You can also make a perfect meal by serving the marinated sashimi over a bed of mâche leaves (lamb’s lettuce) and frisée lettuce, torn into bite-size pieces, accompanied by a few slices of avocado. Slice fish into small, 1/4 inch cubes and add into marinade. Stir well every few hours to ensure equal coverage. Steam frozen soybeans for 5-minutes on medium heat, then put into Cuisinart with wasabi and lemon juice. Blend, thinning with a small amount of water until creamy (approx. 2-minutes). Place marinating fish and edamame/wasabi spread into refrigerator for at least 4 hours. 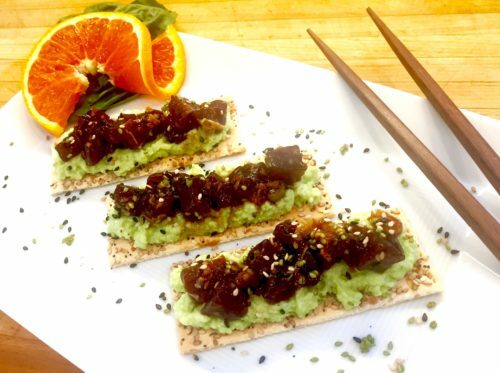 When ready to assemble, place edamame/wasabi spread on top of cracker, cucumber, endive or wonton, and top with marinated sashimi. 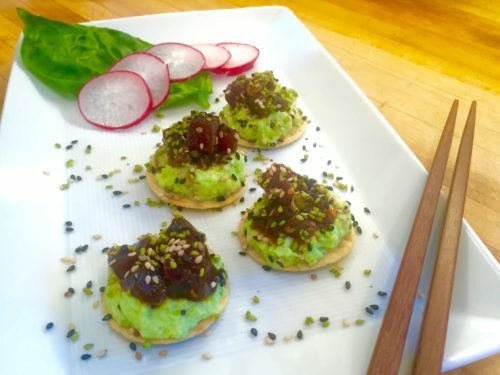 Garnish with fresh scallions and finely chopped cilantro, along with a combination of black and white toasted sesame seeds on top of each appetizer. Le Voov! 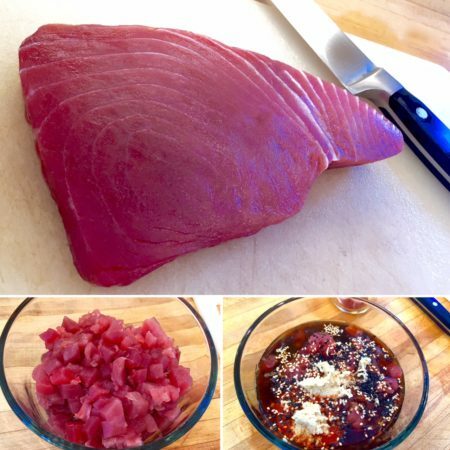 Chef’s Notes: If fresh ahi tuna is unavailable, sushi-grade mahi-mahi makes a good substitute. Sam-J Gluten free Tamari, Sriracha hot chili sauce, and Sushi Sonic 100% Wasabi Powder are all available at our Amazon Store!